Roman soldiers were dressed in beautiful and effective armor. They were covered from head to toe with various pieces of weaponry designed to protect them and equip them for fighting. During his imprisonment in Rome, Paul had opportunity to see how Roman soldiers were dressed, up close and personal. 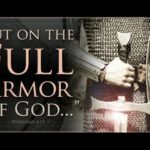 He uses this imagery to impart to us understanding about how God has dressed us in effective armor to defeat the devil. This message reviews the loinbelt, breastplate and shoes.